CoQ10 Lipo 100 (60 vegetable capsules)- Save-On Nutrition Centre Ltd.
CoQ10 is a fat-soluble nutrient that acts as an electron carrier in the mitochondrial electron transport chain. CoQ10 is also a key intracellular antioxidant, protecting phospholipids and mitrochondrial membranes against damage caused by lipid peroxidation. CoQ10 helps to minimize occurrence of migraine headaches, possibly through the promotion of normal mitochondrial function, as mitochondrial dysfunction has been identified as potential contributing factor in migraine pathogenesis. 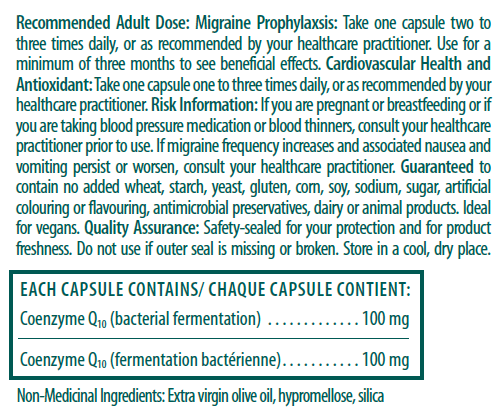 In adult (18-65 years of age) participants with a history of migraines, daily supplementation with 300 mg of CoQ10 was well-tolerated and significantly reduced migraine attack frequency as well as number of days with headaches and nausea in comparison to placebo treatment. CoQ10’s antioxidant actions help in the maintenance and support of heart health. In participants supplemented with 300 mg of CoQ10 daily for 1 month, peak VO2, O2 pulse, and extracellular superoxide dismutase (ecSOD) activity were significantly increased in comparison with placebo. Low ecSOD activity is considered a biomarker for high levels of extracellular oxidative stress.